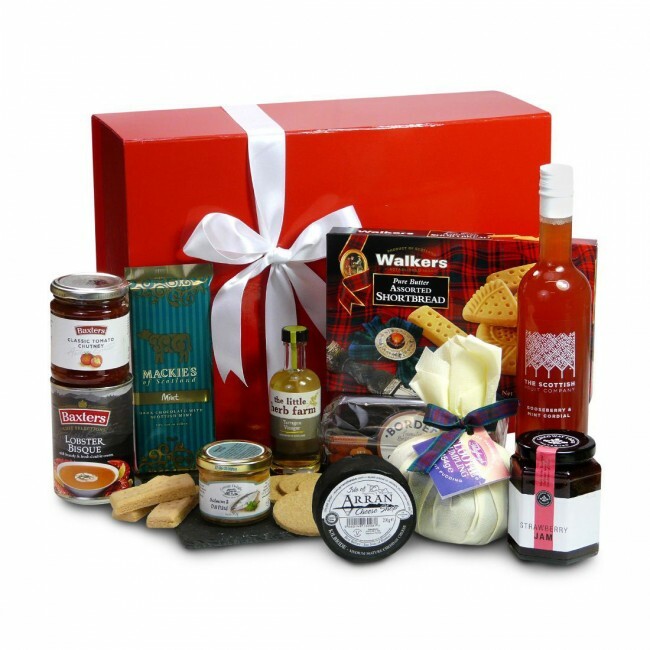 This alcohol-free gift hamper is a perfect balance of sweet and savoury light meals and snacks for couples and families looking for a taste of Scotland. Savoury classics include creamy cheddar cheese from the Isle of Arran, Baxter's tomato chutney prepared according to their family recipe, Baxter's Lobster Bisque, Cottage Delight's Salmon and Dill Pate, and Cullisse Highland Rapeseed Oil pressed in Easter Ross in the Scottish Highlands. For sweetness, feast on traditional fruity Clootie Pudding, handcrafted Strawberry Jam from Galloway, crunchy Dark Chocolate Gingers biscuits and smooth dark chocolates with mint made in the Borders. To drink, enjoy Scottish breakfast tea and award-winning cordial from the Scottish Fruit Company. This Scottish food and drink collection has been designed to be enjoyed throughout the year with items that will add an equally special touch when served at a barbecue or at Christmas. The Fort William Gift Box is carefully packed by hand in a gorgeous gift box. Remember, please tell us what you’d like written on the personalised gift card included inside.